Big Bell Thyme is made from high quality thyme herb leaves. It adds a distinctive aromatic flavour to food. The offered thyme oils are precisely processed from the best quality natural ingredients in sync with all the quality norms. We are giving these thyme oils to patrons at reasonable rates. It is hydro / steam distilled from the flowering tops and leaves of Thyme herb. 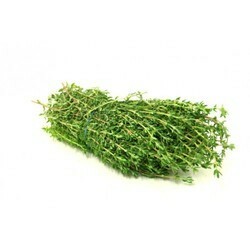 Thyme is grown in India and Spain. The oil is pale yellow in color and has a strong, spicy and herbal odor. It is used in perfumery compounds, flavors and aromatherapy. we deal in Thyme Herb. Thyme herb is packed with numerous health benefiting phyto-nutrients (plant derived compounds), minerals and vitamins that are essential for overall wellness. One of the popular among culinary herb plants, thyme originally is native to the southern Europe and Mediterranean regions. Thyme Herbs is used for flavouring Roast chicken with Thyme, Lemon Thyme Rice, Soups, Herbed Chicken, Roast Potatoes with Thyme, etc. It is also used in Marinating, dressings and with infused oils. 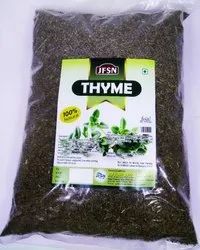 We are leading supplier of Thyme Herb and offer best quality products.Thyme Herb offered come with savory and mint flavour.